A dedicated grandfather has retired from firefighting after three decades of service. Firefighter Howard Newton, 62, joined Wisbech’s on-call crew in 1985 providing round the clock cover. At the time he worked as a welder for a company, which would release him to respond to fire calls during shifts, as well as responding from home. The Wisbech resident said: “My favourite memories must be of the camaraderie between everyone. It’s been emotional, we have had some laughs and some tears but overall it’s been fun. Howard is hoping to spend more time cycling, diving and shooting. He has also recently become a grandfather and looks forward to more family time. Since 2008, Howard has worked as a community fire safety officer at Cambridgeshire Fire and Rescue Service and it was while carrying out a home fire safety check that Howard’s desire to help others resulted in an unusual act of kindness. During a routine home fire safety check, Howard overhead a terminally ill resident mention he wanted to leave his assets to the Royal National Lifeboat Institution (RNLI) but did not mind what happened to his remains. After the man died his ashes were scattered into the North Sea by the crew at the Cromer Lifeboat Station with Howard’s friends and family attending the service. 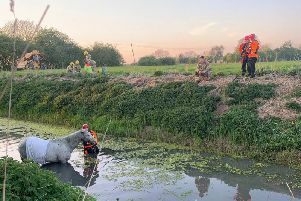 Howard has responded to hundreds of incidents during his time as an on-call firefighter at Wisbech, some more memorable than others. There is always one incident that he says brings a smile to his face. He commented: “We were attending a road traffic collision and it wasn’t long after I started. Somewhat enthusiastically I jumped out of the engine when we arrived on the scene and I started stabilising a car so it wouldn’t roll over. Chief Fire Officer Chris Strickland Officer added: “People like Howard give up so much to serve their community and are an inspiration. Luckily, although Howard is leaving us from the on-call service we still keep him as a community fire safety officer, where his desire to help others and improve people’s lives is a valuable element of making the service we deliver a success. Wisbech Fire Station is recruiting on-call firefighters. For more information, visit the station between 7pm and 9pm on a Thursday, or call 01480 444500.